The 12th Avenue entrance of Sacramento City College will be temporarily closed during construction. Photo by Evan E. Duran. 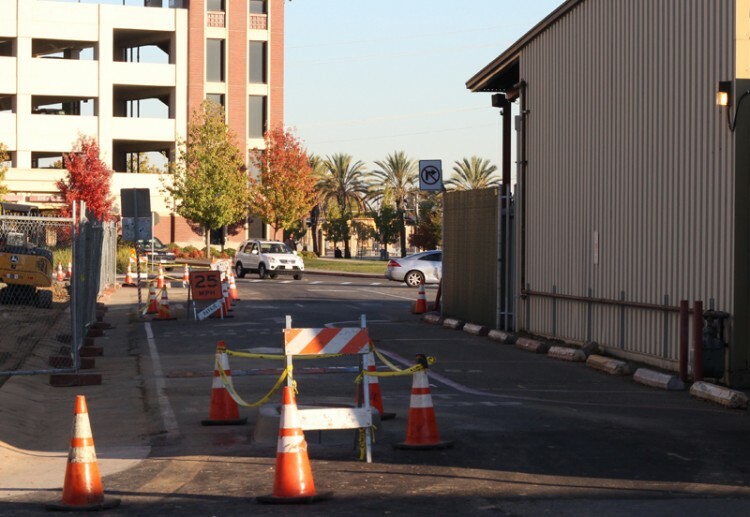 The side entrance to City College at 12th Avenue and Panther Parkway will be closed between 10 a.m. and 2 p.m. on Nov. 15 by the city of Sacramento in an effort to complete improvements to this section of the road as part of a footbridge project. According to Hayman, traffic will be diverted to the west parking lot where drivers can turn left on Panther Parkway to access additional parking. Traffic will also be reduced to one inbound lane, which will be diverted directly into the parking structure. Drivers leaving the parking structure and the North Lot during the closure will need to exit via 24th Street. The footbridge, which will create a path over the light rail tracks next year, will be a part of the Curtis Park Village project slated to begin in 2013. This closure is part of the final phase of improvements to the campus roadways that will help direct foot traffic from Curtis Park Village out to the street. Further information is available by contacting Greg Hayman at (916) 558-2544. This entry was posted in News, Sac City Express (SCC) and tagged 12 Avenue, City College, Curtis Park Village, Director of Operations, diverted, footbridge, four hours, Greg Hayman, North Lot, Nov. 15, Panther parkway, parking structure, street, West Lot. Bookmark the permalink.